Defford, Eckington and Bredon stations on the ex-Birmingham and Gloucester line closed from 4th January 1965. 1965 saw the gradual rundown of steam operations from Worcester shed. The actual closure of Worcester shed to steam operations is believed to be 1st January 1966 (often quoted elsewhere as 31st December 1965) and for at least six months thereafter steam locomotives based at other sheds made regular appearances at Worcester. Nos.2222, 2244, 2253, 3682, 3725, 4113, 4161, 4664, 4680, 6147, 6155, 6169, 6813, 6817, 6819, 6836, 6848, 6856, 6877, 6958, 6995, 7909, 7920, 7928, 8104, 8415, 8793, 9490 and 9680. This is a total of 29 steam locomotives (there were also 12 diesel shunters). Photographs of most of these locomotives now appear on this site. Later in January Nos.3605, 3615, 5971, 7904 and 7919 were all transferred to Worcester whilst No.3725 was withdrawn. 'Castle' class 4-6-0 No.7029 'Clun Castle' worked train code 1Z40, an LCGB special from Paddington to Worcester via Stratford and return. No.7029 worked to Gloucester and No.6848 'Toddington Grange' was used from Gloucester to Worcester and back. The Railway Observer reports that No.8415 had been seen at Bromsgrove on the regular yard pilot duty and goods to Washwood Heath after which the engine returned to Worcester. This was clearly one of the duties for the Worcester engines. Photograph of No.6129 at Malvern Link on the 18:35 from Ledbury to Worcester. Richard Moreton noted No.4168 on the same train the next day. Although regular use of steam locos on passenger trains to London had ceased the previous July they were still used to cover for diesel failures. The Railway Observer reported that No.6856 had been noted at Southall on the 11:15 from Paddington to Worcester. Steam World No.101 published a photo of No.6848 at Norton Junction on a freight train. No.6841 is photographed on the 15:23 Moreton-in-Marsh to Worcester passenger train. The Railway Observer reports that a new steam duty is the 17:37 Worcester to Hereford passenger train returning as 19:10 parcels. This train was usually hauled by one of Worcester's 'Grange' class locomotives. Worcester received six standard class 4-6-0 locomotives Nos.75000, 75003, 75005, 75008, 75022 and 75025. The Railway Observer reported that Nos.75008 and 75022 were regularly used on the morning Worcester to Evesham pick-up freight. Richard Moreton photographed No.6999 at Malvern Wells on 17:23 Worcester to Hereford (that conveyed through carriages from London Paddington). This train regularly changed from diesel to steam at Worcester throughout the summer timetable. The train returned as the unadvertised 19:10 Hereford to Worcester parcels. There is a photograph of No.3682 at Malvern on the daily pick-up freight (Vanishing Points). Preserved 'Castle' class 4-6-0 No.4079 worked an Ian Allan special from Paddington to Worcester and return via Gloucester and Swindon. The Railway Observer reported two uses of steam on express workings: No.6917 on 11:15 Paddington to Hereford and No.70019 on the return working. The latter must however be treated with great caution and might well be an error for a 'Hall' class 4-6-0. The end of most scheduled steam haulage of passenger trains. The 16:25 'school train' from Worcester to Ledbury is dieselised together with the 17:37 from Worcester to Hereford and their respective return trains. One of Worcester's recently allocated Standard Class locos (No.75005) crashes near to Leamington and is withdrawn. A correspondent to the Railway Observer noted the following locomotives on Worcester shed: 3615, 3682, 4680, 6147, 6169, 6838, 3849, 6996, 7822, 9626, 75008, 75022, 75025 and 92029. Diesels seen were: D1600, D1601, D1651, D1722, D6938, D6941, D7057 and D7093. Dumped or stored were:- 3616, 6155, 6813, 6872, 6953 and 75003. Station pilot was 6819 with 75000 on an engineering train. SLS “GWR Cavalcade” special train headcode 1X82 from Birmingham with 7029, 6667, 6435 and 1420. 1420 piloted 6435 on special at Worcester. 6667 was used at Stourbridge and 7029 worked the train back from Gloucester to Snow Hill via Honeybourne. 4555 and 1420 then went to Ashburton. Photograph of ex-SR 'Battle of Britain' class No.34079 '141 Squadron'. It had arrived at Worcester for servicing after taking a special train to Stratford-on-Avon and/or Cheltenham Racecourse (sources differ). The Railway Observer reports the use of No.3682 as a banking engine at Colwall. The Railway Observer reported that the pick-up freight to Evesham is hauled by No.4113. The M.I.A.C. also note this loco and No.4161 in steam on the same date. No.4161 was also in steam on 16th November 1965. No.75078 (70D) noted at Worcester shed. No.4079 “Pendenis Castle on LCGB Railtour to Oxford. John Thickitt of Sheffield visited Worcester to see the Castle” and on shed he saw: Nos.3616*, 3682, 4113*, 6147, 6155*, 6169*, 6819*, 6838, 6856*, 6876*, 6998, 7029, 75003*, 75008, 75025, 92155 and 92247 with diesels W20W*, D1726, D4118, D6854, D6937, D6939, D6941, D6944 & D7066. * indicates locomotives dumped on the Scrap Line. The Yard Pilot (at the southern end of Shrub Hill Station) was either No.4161 or No.6165 (i.e. a 2-6-2T). At Shrub Hill Station ex-LMSR class 5 No.44945 worked through with Nos.4680 and 9626 in use as Station Pilots. The “Railway Observer” noted that No.7029 loco had returned to Worcester for repairs on 23/10/1965 and was on trials at Great Malvern on 23/11/1965. Another working locomotive seen on the same day was “Modified Hall” No.6956 “Mottram Hall” of Oxford shed. No.6998 'Burton Agnes Hall' was noted passing Malvern Link in the direction of Hereford with a permanent way train. No.6147 worked the 16:20 Worcester Shrub Hill - Ledbury instead of the booked diesel. A correspondent to the Railway Observer noted the following locomotives on Worcester shed: 3682 (video on BR Vol.97, in steam), 4680, 6165 (video on BR Vol.97), 6993, 45292 (video on BR Vol.97, in steam), 48374 (video on BR Vol.97, in steam), 75008 with stored locos: W20W (video on BR Vol.97), 3615, 4113 (video on BR Vol.97), 4161, 6155 (video on BR Vol.97), 6169, 6819, 6829, 6838 (video on BR on Vol.97), 6856, 6876 and 75003; station pilot was 9626 (video on BR Vol.97), shunting carriages. Diesels were D1730, D1906, D1954, D6939, D6944 and D7025. No.6872 'Crawley Grange' with a 'Malvern Christmas extra parcels' or the '09:30 parcels to Hereford (Xmas extra)' at Worcester Shrub Hill. No.75008 noted on Oxley shed. This fascinating observation by John A. Thickitt shows that there was still some use being made of Worcester's 4-6-0s at the very end of steam use at Worcester sheds. By 31st the engine had returned to Worcester for withdrawal. Ex-GWR Pannier Tank No.4680 noted in steam on a single carriage at Shrub Hill Station (Pete Wilcox). 'Modified Hall' class 4-6-0 No.7924 'Thornycroft Hall' of Oxford Shed noted by Pete Wilcox heading south on a freight train at Shrub Hill Station. No.75022 and No.6147 which had been at Honeybourne returned to Worcester (see below). Worcester shed closed to steam. The locomotive allocation at closure was Nos.3682, 4680, 6147, 6165, 9626, 75000, 75008, 75022 and 75025. 'Pannier' tank No.3682 was in use as station pilot with No.9626 also in steam. 'Pannier' tank No.9626 was in steam and was used for shunting at Worcester Engine Shed. This was the last Worcester based steam locomotive to be used. The names of the driver and fireman are not known. It is possible that this locomotive has been used for the overnight heating of stock in Midland Road sidings and was thus in steam on the 1st. All Worcester based steam engines out of use. Visiting steam locomotives no longer had access to coal at Worcester. A steam banker was based at Honeybourne until 30th/31st December 1965 (D6943 was then here until 1st/2nd January 1966, when a banker was no longer required). In the final months of steam use this was a duty for a Standard Class 5 4-6-0. There was an afternoon one-coach passenger train to and from Moreton-in-Marsh which was worked by the banking engine. Chris Smith advises that the last steam banker at Honeybourne was No.75022. At closure there were three 'Pannier' tank engines still on the active roster at Worcester. One duty for these engines was station pilot at Worcester Shrub Hill. Steam locomotives were also used on a daily pick-ups freight to Malvern and Hereford, and possibly Evesham and Bromsgrove, and one locomotive was based at Honeybourne. Richard Moreton advises that the 05:35 from Worcester to Hereford and 08:18 return freight train was steam worked to 31st December 1965 when Oxford's No.7922 'Salford Hall' was used. The 61xx tank engines were probably spare. No.6147 was at Honeybourne on 30th December 1965. 17th December 1965 (and possibly this one again on 18th December 1965). Pete Wilcox saw it in steam on 30/12/1965. 9th December 1965. Pete Wilcox saw it in steam on 1st January 1966. 15th December 1965 and either this one or 6165 on 18th December 1965. Chris Smith advises this locomotive was at Honeybourne on 29th/30th December 2012. 14th December 1965. Noted by John A. Thickitt on Oxley shed on 29th December 1965. 14th December 1965. Chris Smith advises this locomotive was at Honeybourne on 30th/31st December 1965. Unidentified member of this class at Malvern probably on Christmas Parcels extra to Hereford. 1966 saw the gradual end of steam locomotive operation in the county and the removal of redundant locomotives for scrap. 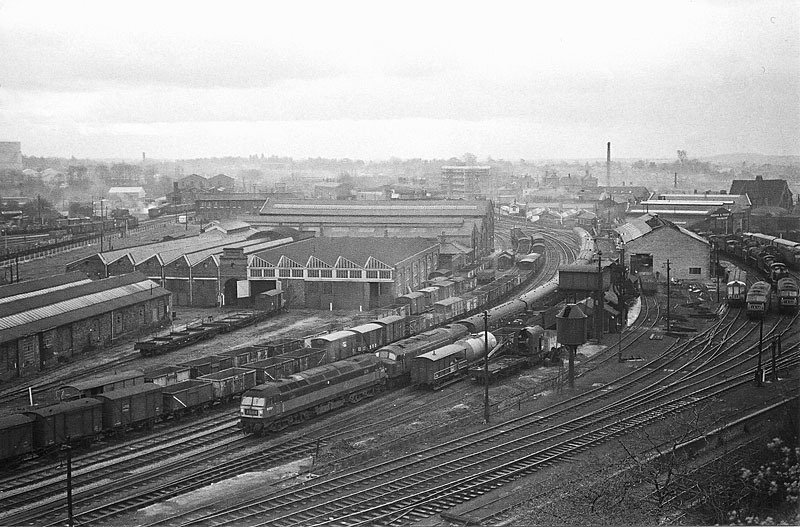 One of the first major developments in Worcester during the first three months of the year was the rebuilding of the former passenger locomotive shed to a diesel depot as shown in Robert Pritchard's photograph (above) that was taken on 31st March 1966. No.75066 (70D) that had presumably brought a sugar beet train to Kidderminster. Also noted on shed by Pete Wilcox. No.9626 (85A) in steam and moving around the shed yard. Certainly the last time a Worcester based engine was in steam! No.3682 was noted dead on Worcester shed (Robert Pritchard). Eleven local stations at Norton Halt, Stoulton, Wyre Halt, Fladbury, Littleton Badsey, Chipping Campden, Blockley, Alrestrop, Pebworth, Long Marston and Milcote closed. No.48404 was in steam at Worcester. An unidentified 5MT or 8F in steam and No.45418 on freight. No.48271 in steam on Worcester shed and an unidentified 9F on freight. Ex-LMSR Stanier 8F class No.48?56 (possible 256 or 556? of Bescot shed) on a northbound freight. An unidentified engine in steam. Two engines working in the yards. An 8F in steam on shed. As soon as steam locomotive use had ended at Worcester work started to convert the former Passenger Engine Shed into a diesel depot By 31st March this work was nearly complete. A 9F on freight in the yard. No.48725 waiting at south end of Worcester tunnel on freight (WLS). No.44828 (55A) seen on freight at Worcester. No.48459 arrived with a freight from the north and left immediately 'for Stourbridge'. No.92228 turned and left light in the Birmingham direction. Worcester's last four steam locomotives Nos.3682, 4680, 9626 and 6147 towed away to Cashmore's at Newport for scrap. Nos.48550 and No.48655 in steam. No.92103 towed No.D2566 + No.D2569 + No.D2570. No.48367 arrived with a freight from the south (also noted by P. Wilcox). No.8718 light engine northbound (possibly the last ever visit by an ex-GWR locomotive). No.92212 + No.D70 on a northbound freight. No.44829 and No.45264 on southbound freights. No. 92239 on southbound freight 29/6/66. No.48674 towed Nos.48633, 75045 and 76020. No.47681 had been abandoned at Worcester on its way for scrap and on 1st October 1966 cutting up had begun with the wheels loaded into a lorry and the boiler on its side. Just the boiler remained on 3rd October 1966. (Peter Martin recorded No.47681 on Oxley Shed on 5th June 1966 and suggests it may have originally been consigned to Cashmore's at Newport. Pete Wilcox advises that he first saw the locomotive intact on Worcester shed on 18th June 1966. From 3rd January 1966 there were no active steam locomotives based at Worcester nor any servicing facilities for visiting locomotives. The nearby locomotive shed at Stourbridge still hosted steam engines (until July 1966) as did Birmingham sheds such as Saltley. Steam engines bringing freight trains to Worcester in 1966 usually turned round on the triangle and headed straight back home. Although it was closed to steam at the same time as Worcester, Gloucester shed did retain servicing facilities for visiting engines. There were regular steam visitors to Gloucester until at least July and a few in the remainder of 1966. Some at least of these trains passed through Worcester but many used the direct line. Towards the end of 1966 Worcester Engine Sheds became home to many stored diesel locomotives. These are covered in 1967 to 1969.